The CH25 Chair, commonly known as the Easy Chair, is one of the less known designs of Hans J. Wegner. The chair perfectly embodies the principles of Scandinavian design. It is simple, appealing, functional and made of sustainable resources. Therefore, the Easy Chair can be considered an archetype of Nordic furniture. Nicknamed ‘The Master of the Chair’, Hans J. Wegner designed the Easy Chair. It was his great passion for the design of chairs that eventually made Wegner a legendary figure in Danish Modernism and world-famous furniture designer. He created more than 500 chairs, many of which went into mass production. His outstanding body of work helped establish his home country as an international leader of modern design. The Easy Chair was one of the first four chairs created by Wegner especially for the Carl Hansen & Søn furniture company. Wegner designed the CH25 in 1950, within the first three weeks of his cooperation with the Danish manufacturer, as a light, sculptural substitute for the heavy, fully upholstered lounge chairs that were popular at the time. In the same year, the Easy Chair was introduced to the public. Due to its warm reception, the chair immediately went into mass production and enjoyed instant commercial success. The CH25 has been in the production ever since. The design of the Easy Chair was refined down to essentials making the form of the chair very minimalistic and pure. Its design embodies its creator’s famous credo: “A chair should have no rear view. It should be beautiful from all sides and angles." Indeed, the chair with its famously organic shape is very appealing and stylish from any angle. 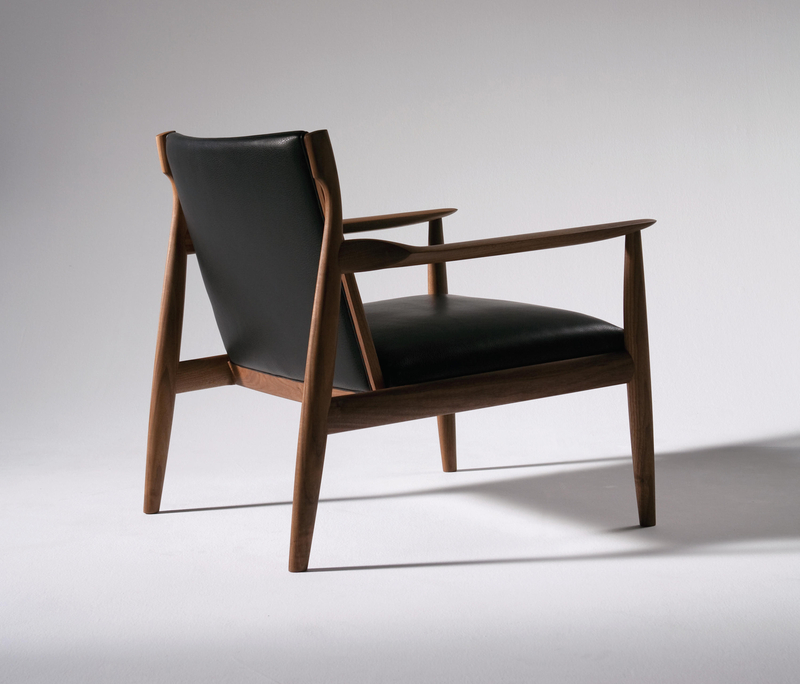 To this day, its design stays true to Wegner’s original sketches and drawings. A light, attractive and comfortable lounge chair, which speaks for itself of everyday containment. It feels as modern today as it did half a century ago. An excellent example of Wegner’s constant striving towards organic simplicity to create sculptural beauty, comfort and outstanding stability. The Easy Chair is yet another proof that Hans J. Wegner was way ahead of his time when it comes to the wooden furniture design. The chair’s minimalistic and straightforward appearance may mislead into thinking that it is relatively easy to make, which is very far from truth. The chair demands a perfect craftsmanship and a thorough understanding of wood joinery. Its manufacturing process requires numerous steps carried out by skilled craftsmen to make this classic come alive. The chair, whose distinctive form resembles a deckchair, was principally designed to provide comfortable lounge sitting. The high level of comfort can be attributed to its sloping, generous arm rests and hand-woven suspended seat and back. Its production utilizes approximately 400 meters of paper cord, a durable substitute for jute developed during World War II. The cord is available in the natural beige colour, or it can be painted black. Its slightly curved back legs and the sides of the seat pan and the back rest are manufactured from a single piece of wood. The front legs of the chair, which provide support for the seat pan and the arm rests, are spanned together with the rectangular slat. All four legs are slightly tapered at the bottom. Utilizing the high-quality natural materials, the chair is made to last for generations. It is available in oak, in a range of finishes: Oil, Soap, Black Stained, White Oil, Lacquer and Smoked Oil. The modest, yet distinctive design, combined with the impeccable quality of craftsmanship, has earned the chair a very special place in the history of interior design. This timeless piece of furniture still looks fresh and appealing, making it a great, tasteful addition to any modern interior. Weaving the chair’s seat and back takes around 10 hours ofcraftsperson’s manual work. The wooden frame of the seat pan and the back rest is first rasped on the edges, so that the paper cord is elevated just slightly above the surrounding wood surfaces, preventing the cord from becoming frail over time. The Easy Chair is one the longest produced chairs offered by Carl Hansen & Søn. It has been in the continuous production since its presentation in 1950. The price of the original chair oscillates around $3500 per piece.